Calls For Widespread Change Challenge Incoming Head Of U.S. Olympic Committee The incoming CEO of the U.S. Olympic Committee faces more challenges than just sexual abuse scandals. Elite athletes are calling for a complete overhaul of the USOC financial model. 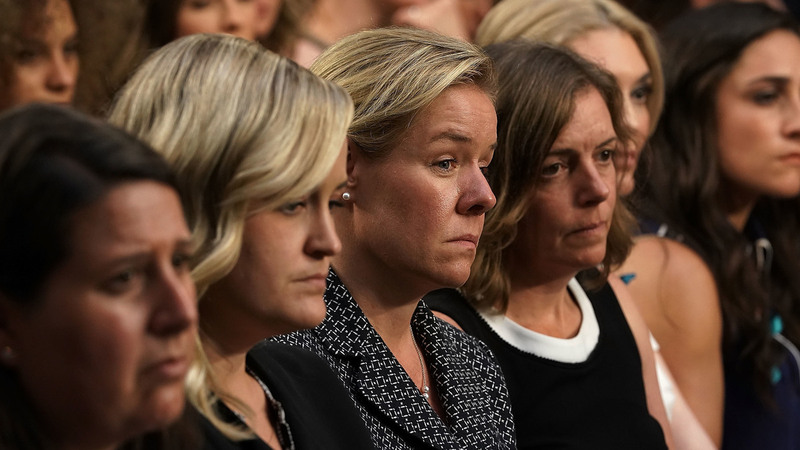 Incoming CEO of United States Olympic Committee Sarah Hirshland (3rd L) listens during a Senate hearing in July. The hearing was to focus on changes made by the United States Olympic Committee (USOC), USA Gymnastics (USAG), and Michigan State University (MSU) to protect Olympic and amateur athletes from abuse. Sarah Hirshland will take over as CEO of the U.S. Olympic Committee starting Aug. 20. Her predecessor, Scott Blackmun, resigned earlier this year in part because of several sexual abuse scandals that have plagued Olympic sports, particularly in gymnastics. Some advocates say that to promote a safer environment for athletes, the USOC should overhaul its financial model. Han Xiao is a former elite table tennis champion who now chairs the Olympic Athletes Advisory Council. In that position he advocates for athletes' interests. Last month, he testified before Congress along with a representative of the U.S. Olympic Committee, the leader of USA Gymnastics and the acting president of Michigan State University. It's not a failing necessarily of the organization. It's a failing of the entire system, the way it's set up. While his fellow witnesses pledged that they had instituted reforms, Xiao said he didn't think much had changed. "It's not a failing necessarily of the organization," he said. "It's a failing of the entire system, the way it's set up." When he finished speaking the crowd erupted into applause. Weeks later Xiao was still stunned by the response. "I didn't expect applause at a Senate subcommittee hearing," he said in an interview with NPR. The audience included dozens of victims of the former team doctor for USA Gymnastics, Larry Nassar. He's in prison now for molesting hundreds of girls and women under the guise of medical treatment. Xiao argues that scandal is an example of how the USOC has misplaced priorities. "Athletes are struggling to stay just above the poverty line in many instances," he said. "Athletes being sexually abused, struggling with mental health and depression without much support. All of these are just indicators to us that athletes are not a clear priority of the organization." A lack of sufficient financial support is a perennial complaint from many elite athletes. According to the USOC, about eight percent of its budget goes directly to athletes. Alan Ashley, the chief of sport performance at the USOC, argues that figure is misleading. He said the organization provides all kinds of support that doesn't come in the form of cash. "When you layer in the cost of training, the cost of competition, the cost to hire coaches, the access to the training centers, that's a lot of direct support," he said. One way the USOC incentivizes success is by providing a medal bonus to athletes. USOC employees also have their compensation tied to Team USA's performance. The more medals athletes win, the higher their salaries. Ashley, for example, took home roughly half a million dollars in 2016, when the U.S. dominated at the 2016 Summer Olympics in Rio de Janeiro. USOC staffers also see a decline in pay if Team USA fails to meet expectations. Ashley said this approach helps USOC employees stay invested in athletes' success: "Let's focus on our efforts on that and let's be measured on whether we are doing a good job there or not." Some athletes are skeptical. Caroline Lind is a two-time Olympic gold medalist in rowing. "It seems a little absurd to me that there was someone who has no connection to us as athletes that's getting bonuses based on our winning," she told NPR. Lind said she had minimal contact with USOC staffers during her rowing career. Even though she won consistently, Lind said her monthly stipend topped out at a little more than $2,000. She claims at one point her funding was cut by almost half, even though she had recently won at major international competitions. The low level of support, and fact that it could change at any moment, made Lind feel that her standing was precarious: "It makes an atmosphere where you don't really feel comfortable speaking up." As Sarah Hirshland takes over at the USOC, she will confront both the fallout from the sexual abuse scandals and the calls from former athletes to make the organization more responsive to those competing for Team USA.